Shotcrete is pumped in with a hose, and blown (or “shot”) into place. The shotcrete phase of your project is probably the greatest amount of work completed, and the biggest “change” or impact that you will see in a single day. This is an amazing process which is really interesting to watch if you happen to have the time to watch. It involves the application of the concrete shell over the re-bar shell and plumbing. Shotcrete provides the structural integrity of UNIQUE pools. UNIQUE uses an “upgraded” mix of concrete in our pools. This step is in excess of standard but we feel that this is a step which will set UNIQUE pools apart from our competition. Our 3500 PSI mix actually contains small fibers which look like small hairs. These fibers, called FIBER-MESH, allow the concrete to bond together at a smaller level, whereas the re-bar allows the pool to withstand larger forces. 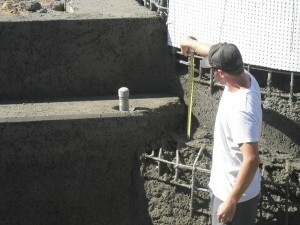 Our shotcrete guys check to make sure thicknesses and coverages are proper. “SHOTCRETE” – BRIEF OVERVIEW : The inspection has been completed for this phase of the project to be underway. The shotcrete process takes only one day. It usually begins around 7AM, with a few trucks and crews, and then the concrete trucks begin to show up. There is a huge rig outside your property which actually pumps the concrete through a hose and into your pool. The “nozzleman” handles the end of the hose and shoots a mix of concrete and high pressure air towards the sides and floor of your new pool. 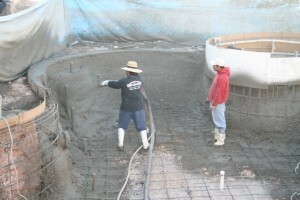 This application technique of “shooting” the concrete into the pool is where the terminology “SHOT – CRETE” comes into play – because it is literally “shot” into the pool. It is an amazing process to see as the crew “carves” and “sculpts” the walls and edges of your new pool. The entire process is over by the end of the day, and the crew does a light cleanup of the site before leaving. The shotcrete guys left a mess, is this normal? As we mentioned above, they do not do a major cleanup when they are done. It is normal for them to leave clumps of concrete around the pool, and even a washout area of concrete somewhere. They do not have the equipment to haul away wet concrete, so they let it harden. It is much easier to clean up later when the project is near completion. I’ve heard talk of “overbreak”. What is this, and when do I know if it applies to me? “Overbreak” is a term used in the pool business which refers to additional shotcrete needed to complete a job. Every pool company bids a project and signs a contract based on 6″ of concrete in the walls and floor of the pool. If there are abnormal soil conditions, then there will be areas with more than 6″ of concrete. This creates need for additional concrete or “overbreak”. 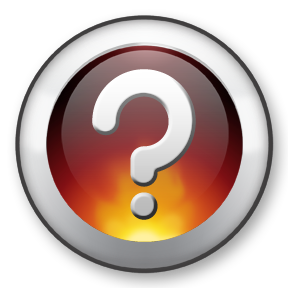 The “overbreak” is always an unknown, and is charged as an additional in the pool industry. This information this is reflected in our pool construction agreements. We can provide you with calculations on exact concrete specified, and then actual concrete supplied by using the concrete mix tickets from the plant if you would like us to. These tickets are supplied to us by our shotcrete crews on EVERY job and are available for your records and review upon request. Should I be upgrading or doing a “stronger” concrete mix? Actually, we use one of the strongest mixes recommended for swimming pools. It’s actually 500 PSI stronger than the engineer’s requirements. After a good “water-curing” process it can harden to over 6000 PSI. On top of that, we integrate FIBERMESH in all of our pools, which helps the concrete resist shrinkage cracks and hairline fractures in addition to major cracks.